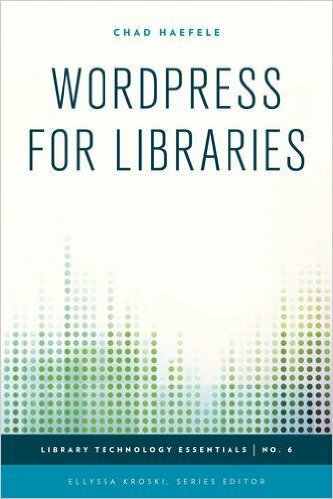 My book, WordPress for Libraries, is available now! I’m giving away a copy to celebrate. To enter, all you have to do is leave a comment here or tweet me (@HiddenPeanuts) with #WPLib. Enter by 11:59PM EDT on Thursday, 9/3/15. The contest is now over. Congrats to @verolynne! Disclaimer: A couple of pages in your prize might be slightly creased by my assistant, pictured below. I currently have a WordPress website in development for my library – our first ever. I’ve been a WordPress admin for about 8 years. I love the plugins and expandability of the platform, but sometimes keeping up with the updates can be a pain (especially when plugins and themes aren’t ready for the updates). Currently I’m trying to learn more about integrating OPACs and user accounts into a WordPress site. My library will be undergoing its first automation as soon as we get the website completed, and I can’t wait to have an online catalog! I already have the other books around this topic, so I’d love to know more about your experiences. I don’t think the others bring your length of experience with your background. 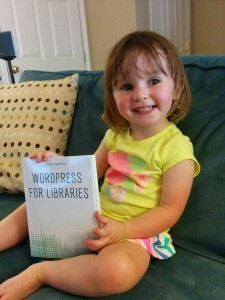 WordPress like: it’s so easy to learn. WordPress dislike: Couldn’t my favorite Themes be available for free? WordPress knowledge want: I want to know all about the nitty gritty of WordPress specifically for Libraries! Especially since I’m about to take a new job in a library system that has never had its own website — and it looks like I’m going to be creating it from scratch! I’d like to read what the expert has to say on the subject.